The Victor was published by D. C. Thomson & Co. Ltd and ran from January 1961 up until 1992. 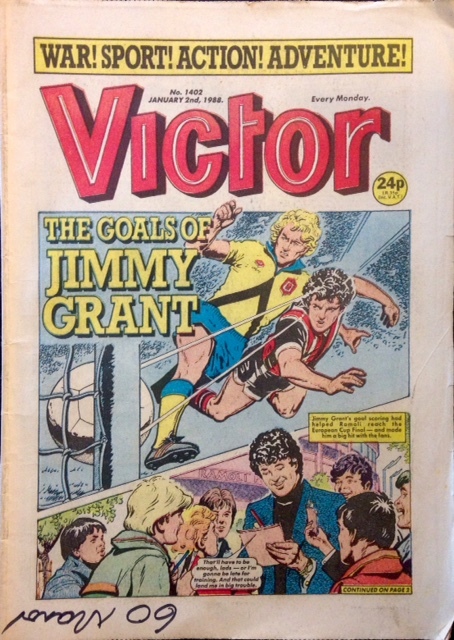 The front cover features ‘The Goals of Jimmy Grant’ and continues on to the next three pages. Next up is ‘Space Hunter’ – Tebor, a criminal from the 31st Century, had travelled through time to our present day. Santori, a hunter android, had been sent to track him down. Santori had teamed up with youngster Tim Price, but Tim had been kidnapped by Tebor’s men. After a violent struggle, Santori and Tebor landed in the sea. This is followed by ‘Sport Crazy’ with Ballboy and ‘Underground Airforce’. Then it’s ‘Lady Luck’ – Who is trying to kill the number one killer? Chicago in the late 1920’s. When Senator Farnham plunged to his death, everybody thought it was suicide…. Alf Tupper and Jimmy Grant’s ‘Talk-In’ covers the centre pages. On pages 21, 22, 23 and 24 is the character: ‘John One’, which is followed by ‘The Sorcerer’s Apprentices’. And finally Jimmy’s Star Choice on the back page is Gary Bannister: ‘Who’s the fastest striker in the First Division? Clive Allen? John Aldridge? Or Alan Smith maybe? 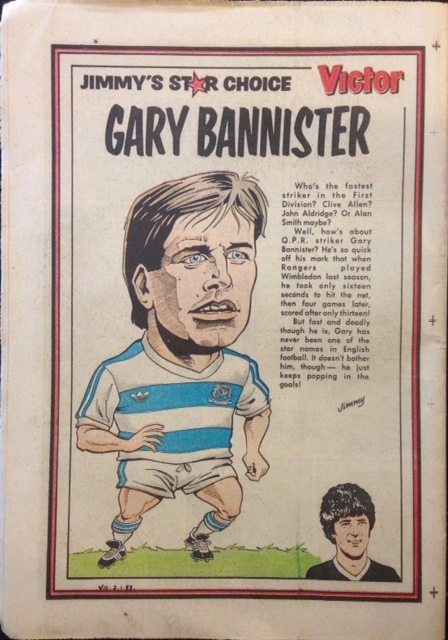 Well, how’s about QPR striker Gary Bannister? He’s so quick off his mark that when Rangers played Wimbledon last season, he took only sixteen seconds to hit the net, then four games later, scored after only thirteen!